, a lady much distinguished by her literary accomplishments, was born in London, August 16, 1679, the daughter of captain David Trotter, who was a native of Scotland, and a commander in the royal navy, in the reign of king Charles the Second. Her mother was Mrs. Sarah Ballenden, nearly related to the noble lord of that name, and to the illustrious families of Maitland, duke of Lauderdale, and Drumrnond, earl of Perth. She had the misfortune to lose her father when very young; an event which also reduced her mother to narrow circumstances. In her childhood, she surprised a company of her relations and friends with some extemporary verses, on an incident which had happened in the street, and which excited her attention. By her own | application and diligence, without any instructor, she learned to write, and also made herself mistress of the French language; but had some assistance in the study of the Latin grammar and logic; and of the latter she drew up an abstract for her own use. She was educated in the protestant religion, but having an early intimacy with several Roman catholic families of distinction, she was led, when very young, to embrace the Romish communion, and continued in it for some years. We are more inclined to agree with Dr. Beattie, that this tragedy ought to have been suppressed. 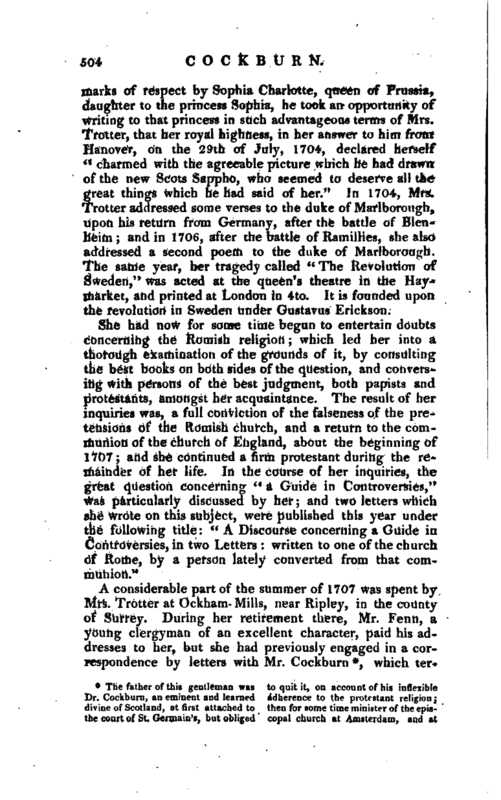 That critic adds, “’It does her no credit, and shews her to have been at eighteen a greater adept in love matters than unmarried women of that age are commonly supposed to be.” He refers the blame, however, to “her youth, and the licentiousness of the English stage in the end of the last (seventeenth) century.” Forbes’s Life of Beattie. She also received a letter of thanks for this piece from Mrs. Burnet, the last wife of the celebrated prelate of that name. It appears, that at the latter end of 1701, she was some time at Salisbury, on a visit to her relations in that city. 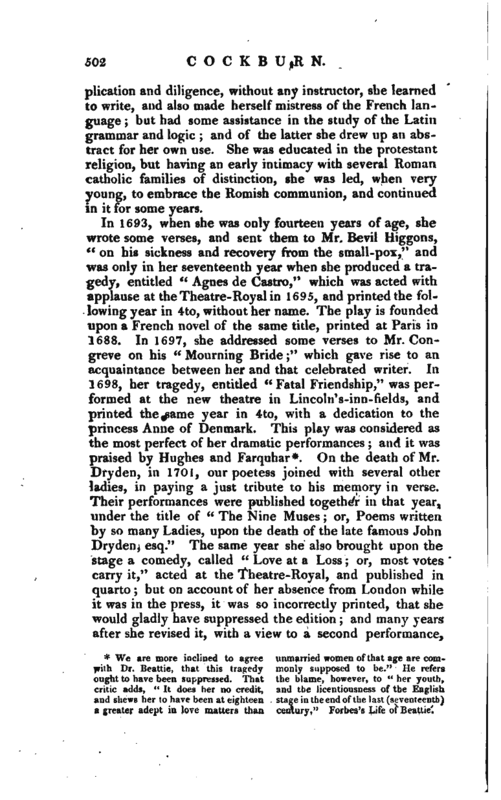 Mrs. Trotter still continued in the communion of the church of Rome; and the sincerity of her attachment to it, in all its outward severities, obliged her to so strict an observance of its fasts, as proved extremely injurious to her health. This occasioned Dr. Denton Nicholas, an ingenious and learned physician of her acquaintance, to advise her by a letter, dated October 19, 1703, to abate of those rigours of abstinence to which she addicted herself; which he represented as insupportable to a constitution naturally infirm: and he desired her to shew his letter to her friends and confessor for their satisfaction. What effect this remonstrance had, we are not told. 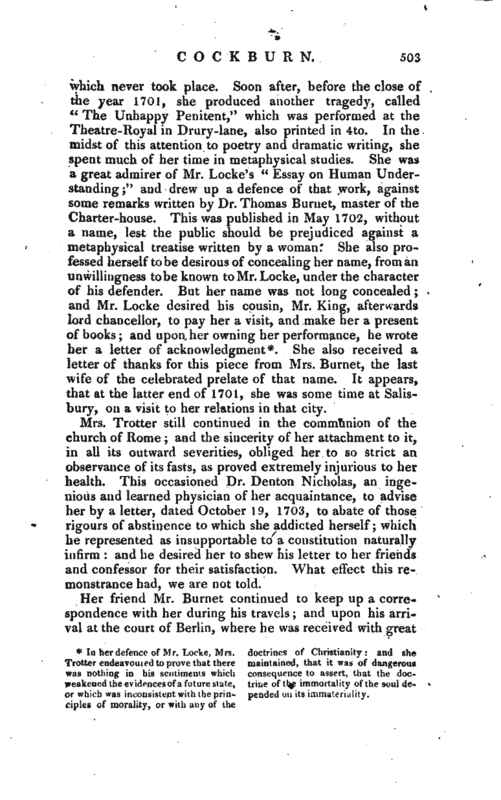 Her friend Mr. Burnet continued to keep up a correspondence with her during his travels; and upon his arrival at the court of Berlin, where he was received with great | marks of respect by Sophia Charlotte, queen of Prussia, daughter to the princess Sophia, he took an opportunity of writing to that princess in such advantageous terms of Mrs. Trotter, that her royal highness, in her answer to him from Hanover, on the 29th of July, 1704, declared herself “charmed with the agreeable picture which he had drawn of the new Scots Sappho, who seemed to deserve all the great things which he had said of her.” Jn 1704, Mrs. Trotter addressed some verses to the duke of Marlborough, upon his return from Germany, after the battle of Blenheim; and in 1706, after the battle of Ramillies, she also addressed a second poem to the duke of Marlborough. The same year, her tragedy called “The Revolution of Sweden,” was acted at the queen’s theatre in the Haymarket, and printed at London in 4to. It is founded upon the revolution in Sweden under Gustavus Erickson. last collated to the rectory of Northall in Middlesex, by Dr. Robinson, bishop of London, at the recommendation of queen Anne, who intended him for one of the bishops of our American Plantations, if the scheme of establishing them had been executed. He was a man of considerable learning, and published, in the Weekly Miscellany, a defence of prime ministers, in the character of Joseph; and likewise wrote a treatise on the Mosaic deluge, published since his death, a volume of Sermons, several single discourses, a funeral sermon for bishop Compton, a work called “Right notions of God and Religion,” another very curiout volume entitled “The History and Exanimation of Duels,” 1720, 8vo, and some tracts on religious subjects. He died Nov. 20, 1729, and was buried in the chancel at Northall. 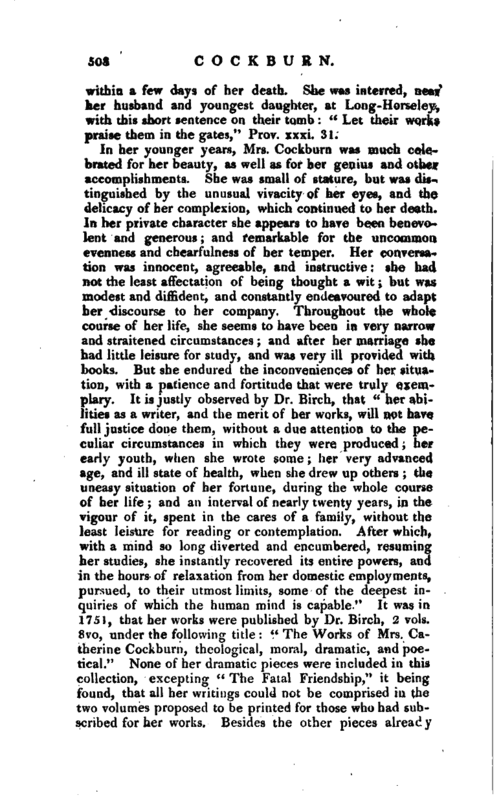 Birch’s Life of Mrs. Cockburn, and Lysons’s Environs, vol. III. There was a contemporary, a Dr. William Cockburn, a physician, and author of some medical tracts, probably a relation of Dr. John Cockburn, who died in 1739. There is some account of him in Rees’s Cyclopaedia, and in Noble’s Continuation of Granger, but scarcely important euough for a separate article. which | terminated in a mirriage in the beginning of 1708. Mr. Cockburn had taken orders in the church of England but a short time before his marriage; and soon after that event, he had the donative of Nayland in Suffolk, where for some time they settled; but Mr. Cockburn removed to London to be curate of St. Dunstan’s church in Fleet-street. Ii* this situation he remained till the accession of king G^oFge the First, when, entertaining some doubts about taking the oath of abjuration, he was obliged to quit his curacy, and for ten or twelve years was reduced to great difficulties in procuring subsistence for his family. During that period, he was employed in instructing the youth of an academy in Chancery-lane in the Latin tongue. But in 1726, by consulting the lord chancellor King, and his own father, upon the meaning and intent of the oath of abjuration, and byreading some papers which were put into his hands upon the subject, he was at length reconciled to taking it. 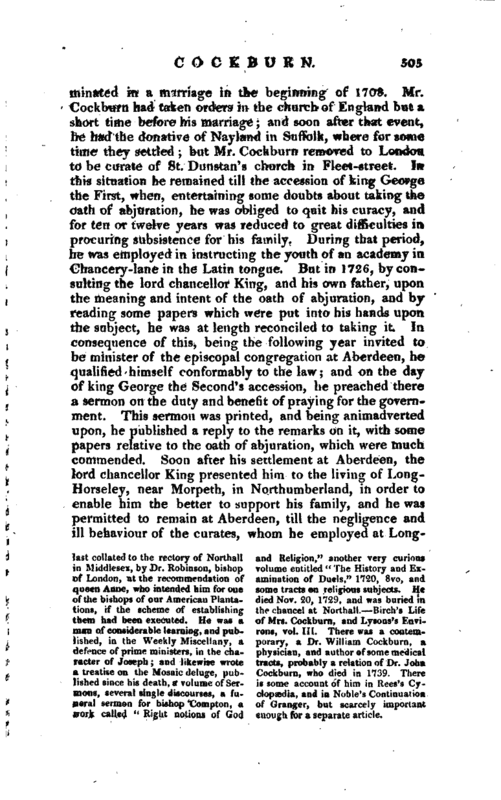 In consequence of this, being the following year invited to be minister of the episcopal congregation at Aberdeen, he qualified himself conformably to the law; and on the day of king George the Second’s accession, he preached there a sermon on the duty and benefit of praying for the government. This sermon was printed, and being animadverted upon, he published a reply to the remarks on it, with some papers relative to the oath of abjuration, which were much commended. Soon after his settlement at Aberdeen, the lord chancellor King presented him to the living of LongHorseley, near Morpeth, in Northumberland, in order to enable him the better to support his family, and he was permitted to remain at Aberdeen, till the negligence and ill behaviour of the curates, whom he employed at | LongHorseley obliged him to quit his station at Aberdeen in 1737, whereby his income was considerably lessened. 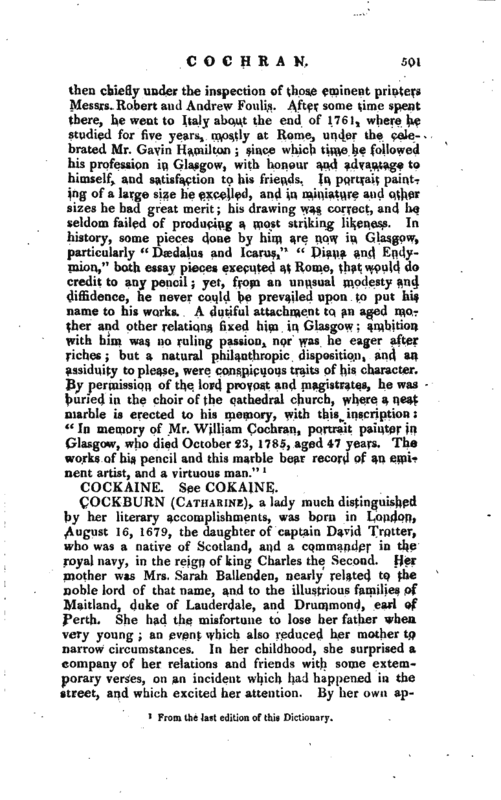 Mrs. Cockburn, after her marriage, was almost entirely prevented from any application to her studies, for many years, in consequence of her close attention to the duties of a wife and of a mother. To the ordinary cares of an increasing family, were added those resulting from the straitened circumstances of her husband; so that she had little time for reading. But in 1726, when she had been married about eighteen years, she published, “A Letter to Dr. Holdsworth,” in vindication of Mr. Locke. Dr. Holdsvvorth, who was a fellow of St. John’s college in Oxford, had preached a sermon before the university, on John v. 28, 29, concerning the resurrection of tfee same body. 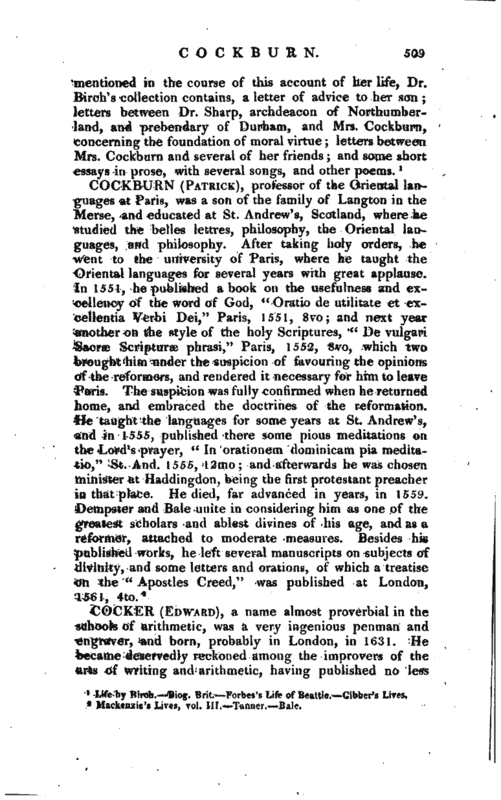 This sermon he afterwards printed in 8vo, professing, in his title page, to examine and answer “the cavils, false reasonings, and false interpretations of scripture, of Mr. Locke, and others, against the resurrection of the same body.” Mrs. Cockburn remonstrated, in her publication, against the manner in which Dr. Holdsworth had treated Mr. Locke: and urged, that it could be of no service to the church, nor was it in any respect prudent, to take so much pains to rank Mr. Locke amongst heretics, and the worst enemies of Christianity. Dr. Holdsworth, however, renewed the charge in his “Defence of the doctrine of the Resurrection of the same Body,” 8vo, 1727. 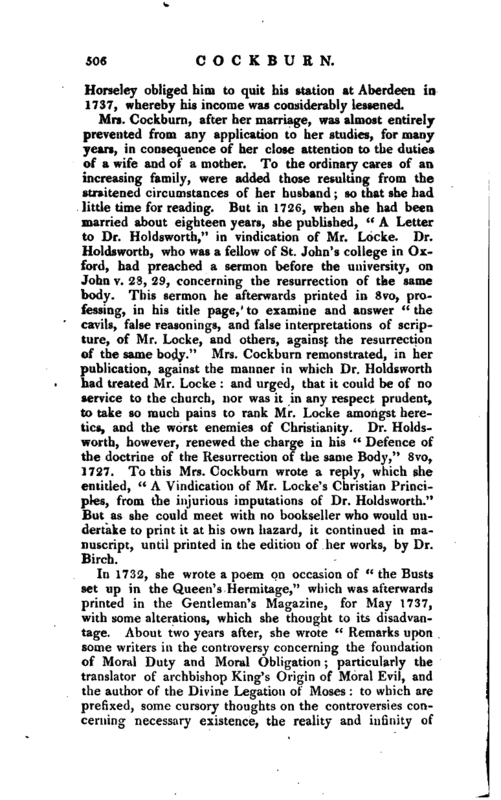 To this Mrs. Cockburn wrote a reply, which she entitled, “A Vindication of Mr. Locke’s Christian Principles, from the injurious imputations of Dr. Holdsworth.” But as she could meet with no bookseller who would undertake to print it at his own hazard, it continued in manuscript, until printed in the edition of her works, by Dr. Birch. Mrs. Cockburn’s name was not prefixed or subjoined to these remarks; but they were “inscribed, with the utmost deference, to Alexander Pope, esq. by an admirer of his moral character.” She had conceived an high veneration for Mr. Pope, and was desirous of being made known to him, but seems to have known little of him, as among his virtues, she enumerates his friendship for Patty Blount. It appears by her remarks on the writers concerning the foundation of morality, that she maintained the opinion of Dr. Samuel Clarke, that there are eternal and immutable relations, essential differences of things, and fitnesses restilting from them, independently of the will of God, which are obligatory on all reasonable beings, antecedently to any positive appointment, or declaration of the will of God concerning them. These remarks continued in manuscript till the year 1743, when they were printed in “The History of the Works of the Learned.” She had the misfortune this year to lose a daughter; and it appears also, that she had at this time a son in Germany, in some office connected with the army, and who was afterwards clerk of the cheque at Chatham. 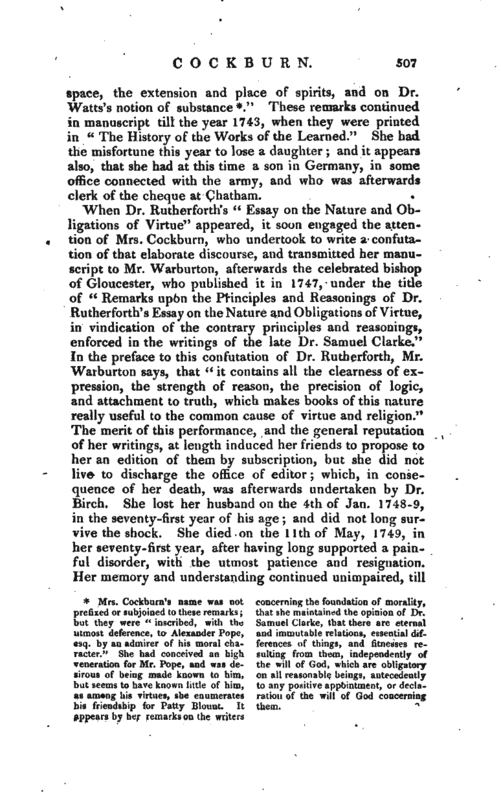 When Dr. Rutherforth’s “Essay on the Nature and Obligations of Virtue” appeared, it soon engaged the attention of Mrs. Cockburn, who undertook to write a confutation of that elaborate discourse, and transmitted her manuscript to Mr. Warburton, afterwards the celebrated bishop of Gloucester, who published it in 1747, under the title of “Remarks upon the Principles and Reasonings of Dr. Rutherforth’s Essay on the Nature and Obligations of Virtue, in vindication of the contrary principles and reasonings, enforced in the writings of the late Dr. Samuel Clarke.” In the preface to this confutation of Dr. Rutherforth, Mr. Warburton says, that “it contains all the clearness of expression, the strength of reason, the precision of logic, and attachment to truth, which makes books of this nature really useful to the common cause of virtue and religion.” The merit of this performance, and the general reputation of her writings, at length induced her friends to propose to her an edition of them by subscription, but she did not live to discharge the office of editor; which, in consequence of her death, was afterwards undertaken by Dr. Birch. She lost her husband on the 4th of Jan. 1748-9, in“the seventy-first year of his age; and did not long survive the shock. She died on the llth of May, 1749, in her seventy-first year, after having long supported a painful disorder, with the utmost patience and resignation. Her memory and understanding continued unimpaired, till | within a few days of her death. She was interred, near her husband and youngest daughter, at Long-Horseley, with this short sentence on their tomb:” Let their works praise them in the gates," Prov. xxxi. 31. Life by Birch.—Biog. Brit.—Forbes’s Life of Seattle.—Cibber’s Lives.